No, I’m sorry. The staple of Venice is not pasta. Yes, in Italy, they eat pasta, but Venice and the neighboring Veneto region are relative newcomers to both pasta and Italy. Venice and the Veneto, which the Venetian Republic dominated for centuries, only became part of the Kingdom of Italy in 1866 to escape the rule of the Austrian Empire, imposed after the Napoleonic Wars. Before that, the people of the Veneto didn’t speak much Italian; they primarily spoke Venetian. 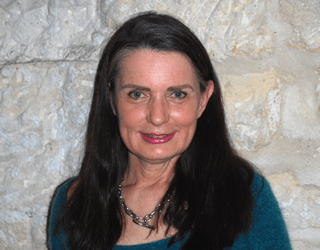 The Italian language and customs? They’ve adopted those, including pasta, relatively recently. In contrast to most of Italy, the Veneto’s main starches are polenta and rice; pasta appears, but only on the odd day. Dine out with a Venetian and you can be sure he’ll order risotto or eat a dish served with polenta as a side. And sometimes, potato gnocchi. In the Roman Empire — and even now in Italy — “polenta” consisted of what we call “mush” or gruel, but it can be made from almost any grain, corn polenta being the most widely marketed. Millet, also eaten as porridge, grew wild in Europe as far back as 4000 B.C., so the first Venetian polenta was certainly millet mush. Thanks to millet’s short time to harvest, it was most likely the crop of the earliest, post-nomadic farmers inhabiting the Veneto. A kind of emmer wheat had grown wild and was domesticated early on. It was mainly eaten as gruel or flat bread, and sometimes made into beer. Corn arrived late on the scene, brought back from the New World, and eventually replaced millet. Until the end of World War II, residents of the Veneto ate mainly white-corn polenta, a variety called biancoperla. This corn is hardy, although its yields are lower than the yellow most commonly found these days. If you see white polenta in a restaurant, it is often a sign of quality, since it is not only rare, to the point of being given Presidium status by Slow Food, but more expensive. Rice was introduced to the Veneto by Benedictine nuns in the sixteenth century and the oldest variety carries the name of the village where the abbey was located, Grumolo delle Abbadesse. Rice caught on to the point that in the same century, Marc’Antonio Sarego, a wealthy man from Verona, sold a large estate to buy up marshy lands to grow rice. More investors, many from the city of Venice, followed his example, and thanks to their profits, many of the Palladian villas were built. Potatoes and sweet potatoes arrived from South America later in the sixteenth century. Several varieties of potato, including those from Cologna and around Vicenza, Padua and Verona, are highly valued and referred to as patata veneta. Sweet potatoes are grown near the riverbeds in the region around Brenta. Those of Anguillara are most prized. With the introduction of other grains, millet became the staple of the poor or fodder for livestock, while wheat, a wild grass that had long been cultivated, became the rich man’s grain of choice. Nowadays, the Veneto is full of Triticum of many kinds: hard wheat, soft wheat, winter wheat, summer wheat, and spelt, as well as buckwheat. There is bread on every table, usually made from bleached white flour, although more sophisticated bakers use buckwheat, spelt, corn, rye, barley, corn, and several other types of wheat and grains from the region. The plains of the Veneto are a treasure-house of grain and the Venetians make full use of the diversity in their cuisine. Many varieties and colors of each exist, including the IGP-protected black rice known as Vialone Nano Veronese. Belluno in the north is known for its ancient variety of barley, dating back to the time of the original Veneti inhabitants, and Verona for stone-ground Bramata corn polenta, coarser and not precooked. So in plain talk and culinary terms, what does this mean? It means a style of cuisine based on these grains, mixed with a panoply of other products from the sea and land. Corn polenta is eaten as a side dish or a main dish mixed with meat, and sometimes with fish or seafood. It’s either eaten soupy, or sometimes left to cool, then fried until crispy. It can be coarsely ground, as in the case of Bramata, or finely ground into white cornmeal. Polenta is eaten as a porridge made with milk, called polentina; as polenta pastizzada, layered with meat similar to lasagne; or as polenta con osei or połenta e oxeli, served alongside small game birds. Baccalà alla vicentina, made with the stockfish (dried cod) common throughout the Veneto, is served with a semi-runny white polenta, and fegato alla veneziana, calf’s liver with onions, with either grilled or creamy white polenta. Baccalà mantecato, a mousse made with stockfish, oil, milk, and garlic then laid on a cake of fried polenta or bread, is served in the wine bars of Venice as a cicchetto, the Venetian version of tapas. In the Polesine, the area just south of Padua and Venice, white corn has historically been preferred over the yellow. Polenta alla carbonara, made also further south in Le Marche, contains Bramata cornmeal and guanciale. Polenta con i ciccioli, often served as an hors-d’oeuvre with drinks, is rendered pork fat cooked with polenta. For a seasonal appetizer, schie, tiny grey lagoon shrimp, are nestled atop a bed of white polenta. Cornmeal is not limited to savory dishes. In Padua and Rovigo, smejassa, a sweet focaccia made with cornmeal, aniseed, and fruit, appears on the feast of St. Martin and Christmas Eve. In bakeries and at home, zaletti, also known as zaeti in the Venetian language, are prepared with finely ground cornmeal, butter, and raisins. The Veronese make Tressian, a cornmeal cake known as Amor Polenta in other places in the Veneto. Pinza Dolce Veneto, a cake eaten at Epiphany, combines cornmeal and wheat flour with dried fruit such as raisins, figs, and dates, and is flavored with grappa, fennel seeds, and orange zest. In the countryside around Verona and Vicenza, during Carnival, they eat polenta fritelle, sugar-coated fritters, called fritole in Venetian. 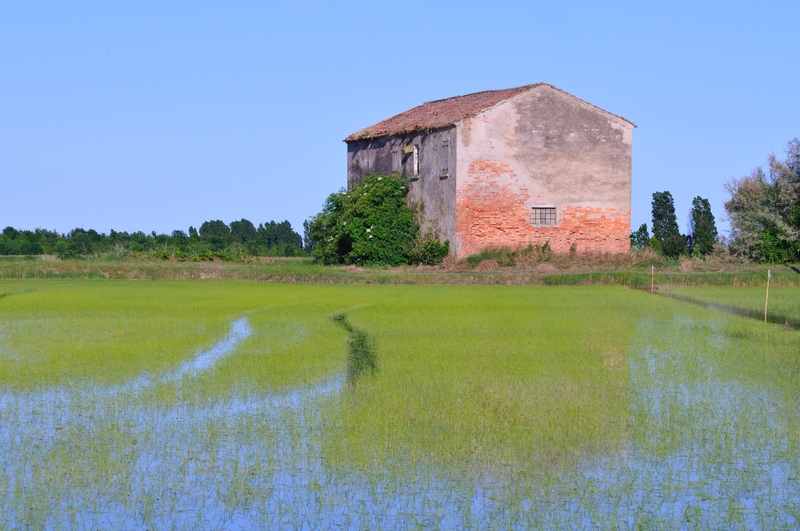 Rice (riso) and risotto are eaten all over the Po Valley and north of Italy. Long-grain rice is used for soups and desserts, and shorter-grain, high-starch rices that stick together when cooked for risotto. These include Arborio, Baldo, Carnaroli, Maratelli, Padano, Roma, and Vialone Nano, among others. Risotto is cooked differently from plain rice or pilaf and from boiled rice in that it is never boiled. A soffrito is made from fat and shallot or onions. Rice is added to this and stirred until it toasts. White wine is then poured in and cooked to absorption, and finally, broth is added ladle by ladle until the rice is cooked. Butter and Parmigiano-Reggiano are usually tossed in at the end. In the Veneto, risotto is almost like rice soup, a consistency referred to as all’onda, and quite different from the version popular in the rest of Italy. The rice must be firm (al dente), not soft or over-cooked, while the risotto itself should have a creamy consistency. It is eaten with a spoon, normally as a starter or primo, sometimes as a main dish. Venetian risotto might be seasoned with seafood, meat, or seasonal vegetables, but care is taken not to mix too many flavors at once. By far the most celebrated risotto in Venice is risi e bisi, made with fresh spring peas using a special method. It is said there should be as many peas as there are grains of rice, but because peas are expensive and labor-intensive, that rarely happens. In the Veneto, unlike in the rest of Italy, the peas are mixed into the risotto instead of served on top. Asparagus, strawberries and grape risotto are savory, made with garlic, oil, and parsley, and finished with Parmigiano, depending on the area. Porcini mushroom risotto is a classic, and radicchio, the king of Veneto vegetables and available all year long, is another favorite, although it’s not often found in restaurants. In risotto al nero di seppie, squid ink dyes the white rice black. The Burano specialty risotto de gò — the best I’ve had was on this lagoon island of fishermen, where it’s made to order — is prepared using goby fish, and is rare enough in Venice proper. Traditionally made with lobster, shrimp and squill, risotto ai frutti di mare is the star of most tourist restaurants, and you’ll often fall upon risotto ai gamberi, i.e., with shrimp. Due to the length of cooking time, it is more often than not microwaved and therefore served overcooked, so take care to order it in a top-notch restaurant. Vegetarians will love pumpkin risotto — risotto alla zucca or de suca, served as a savory starter. Risotto is sometimes made with meat. Chicken liver risotto is seasoned with sage. I’ve even had risotto made with expensive Amarone wine instead of the classic white wine. Every respectable cook in the Veneto makes homemade potato gnocchi. You can always recognize when they’re homemade because they’re hand-shaped and irregular. Gnocchi with tomato sauce will please even the most finicky eater, and if you see granseola (spider crab) sauce, go for it because it’s rare and entails much labor. Potato polenta is mixed with chestnut flour and seasoned with salami, meat, cheese, and a variety of other ingredients in neighboring German-speaking Trentino. Riso e patate, a common poor man’s food, especially in winter, is cooked in meat broth. It dates from the Austrian occupation. Sweet potatoes bear many names in the Veneto: patata americana (Italian) or mericana (Venetian language) or patata dolce or batata. It’s rare to see them in restaurants, but around Padua, they may pop up in homes as gnocchi, pies, and even risotto, much in the same way as pumpkin. In Padua, sweet potatoes also appear in the form of a cake with pine nuts. Even the famous gastronome, Pelligrino Artusi, included a recipe for sweet potato pie with almonds in his nineteenth-century survey of Italian cuisine, Science in the Kitchen and the Art of Eating Well. And finally, pasta. Venetian cuisine does not entirely omit pasta from its starch pantheon. Pasta e faxioi, or in Italian pasta e fagioli, a hearty soup traditionally eaten in the countryside, now found in simpler city restaurants as a starter, combines fresh or dried Lamon beans from Belluno — a kind of borlotti — with pancetta, potatoes, and other vegetables, and a small pasta such as macaroni or ditalini, seasoned with rosemary. Legend has it that bigoli, the most prevalent pasta in the Veneto, saw the light of day in Padua in 1604 when a machine called a bigolaro was patented for making vermicelli and “long pasta,” made with soft wheat, water, and salt. Durum wheat and buckwheat versions came later. Bigoli in salsa or en sarde, considered a dish of “atonement” according to Catholic tradition in Venice, is consumed on Christmas Eve, Good Friday and Ash Wednesday, and is now found in practically any true Venetian restaurant any day of the week. It is made from fileted sardines or anchovies, depending on the catch, and marinated for at least 24 hours in white wine vinegar, slow-cooked onions, pine nuts, and raisins, with many variations on this theme. Sarde sauce can be eaten as cicchetti, the traditional small plates eaten in Venetian bars, served on bread or a bed of polenta, or as a sauce with bigoli or other pasta. The lagoons of the Veneto are full of ducks and other wildfowl so bigoli con anatra or bigołi co’ l’arna in Venetian, originally from Padua and Treviso, is a ragù of duck, including the duck liver and innards, traditionally cooked in its own fat and served over bigoli. It’s slow-cooked, so not common in restaurants, but pure delight. Seeing it on a menu is generally a sign of the authenticity of the restaurant. Ask someone from Vicenza what pasta their grandmother made and they’re likely to say gargati, a macaroni-like egg pasta made from a mixture of hard and soft wheat. Gargati con il consiero is made with strips of pork fat, white wine, onions, parsley, nettles or other herbs, and tomatoes. Today, mixed ground meat might also be added, and the same sauce might be found on bigoli or in lasagne. Tortellini di Valeggio, found in the region of Verona, are stuffed with Grana Padano cheese and ground pork and chicken, and are cooked in meat broth. Many of the dishes listed here are only found in people’s homes or in select restaurants in the region or cities I mentioned. The list of dishes can serve as reference as you travel around the Veneto. In Venice proper — a destination for unaware tourists in search of pasta and pizza, thinking it’s like the rest of Italy — you won’t find many traditional Veneto recipes, but if you do, go for it. It means that the cooking was probably inspired by a nonna from the region.